A spread of three tarot cards spells one reporter's status quo. Tarot has had a long reputation of “woo-woo” and fortune-telling, but over the last few years, it’s blossomed into a modern practice that doesn’t rely on its former stereotypes. 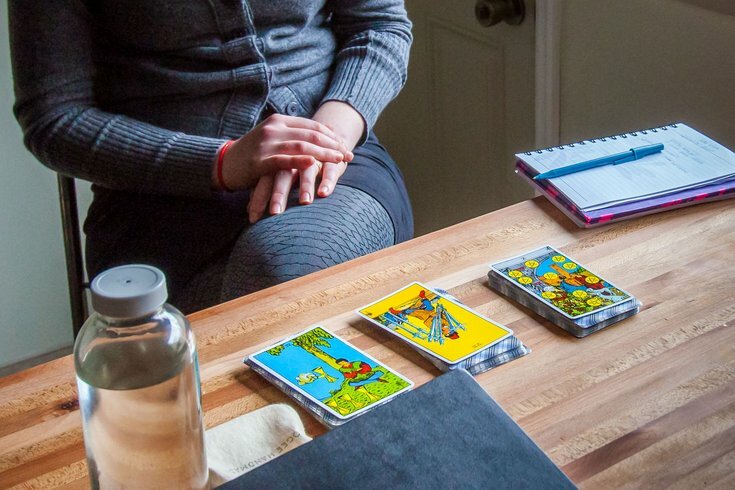 Across Philadelphia and across the country, tarot has surged as part of a wellness practice. It doesn’t take much effort to find Instagram health and wellness accounts with a smoothie bowl post and right next to it a tarot spread. It’s become an aesthetic in many ways, from the Tarot Planner to the Lisa Frank tarot deck. But the designed appeal for the look of tarot hides the truth in its real practice, the practice of self-care. Are witches and their descendants offended when politicians use the term 'witch hunt'? “I see tarot as just another facet of my spirituality,” says Angela Monaco, shop owner of Ritual Ritual, a Northern Liberties "metaphysical" boutique that offers a curated collection of handcrafted jewelry, reiki and massage therapy services, tools of divination, repurposed vintage, apothecary, and home goods. Originally started as a card game called tarocchini in 14th-century Italy, tarot became a form of cartomancy, or divination with cards. The original Rider-Waite deck, published in 1909, helped spearhead the occult tarot that is most commonly used today. There are 78 cards in the deck, and there are 22 major arcana cards, and 56 minor suit arcana cards. The definition of arcana is “secrets or mysteries,” and how to use this deck of cards can be a bit more cryptic. Though, at the end of the day, it’s about what speaks to you. “But I think just for people to get started…[people] should go towards what people are drawn to,” Monaco nods, pointing towards the tarot decks. Tarot isn’t the only form of cartomancy. Oracle decks is another popular form of divination that call on the ideas of spirit animals or angels as opposed to the archetypes of the classic Rider-Waite tarot deck. One artist, Rebekah Erev, felt inspired to make her own deck. Originally from South Jersey, she recently moved back to Philadelphia after 18 years on the West Coast. “I’m not a huge deck person. I basically created my deck so I could have a divination tool,” she said. Her Moon Angels Oracle deck has 29 crafted cards to reflect each day of the moon cycle. “I’ll just pull two cards sometimes, and two cards is really nice because you can't really look at things as ‘past, present, future,’” says Amanda Medina, a yoga instructor and astrologer who uses tarot cards in her astrology practice. Everyone has a different approach, as tarot or cartomancy seems to hinge on this idea of intuition rather than planned or formed actions. Erev, who customized her deck based on her own intuition, sees it as a highly functional tool to be used. “I really think and have experience for myself that intuition is something that you can cultivate, like any other skill," she said. I really think and have experience for myself that intuition is something that you can cultivate, like any other skill." There is another side to tarot, however – one embroiled in its religious objectifications as well as its “fortune-telling” stereotype. The surge of tarot and other divination practices may also come from the push for highly personalized spirituality as opposed to religious dedication. According to a 2017 PEW research study that examined a national sample of more than 5,000 people, 47 percent of men and 53 percent of women in the U.S. considered themselves spiritual, but not religious. Spirituality is an important factor for Erev, a Kohenet Hebrew priestess, who finds inspiration in the spirituality of her heritage. “There’s an idea in Judaism that all the stars are angels,” she said. Currently in the process of designing her second deck, Erev is designing each deck after a character in the Hebrew alphabet and pairing it with an animal. While fortune-telling may be one aspect of it, too, the average usage of tarot seems more about studying the present than predicting the future. “Tarot is the divination of the subconscious,” says Monaco. According to Sigmund Freud, the “unconscious” is comprised of thoughts that are outside our conscious awareness, influencing all of our behavior. This unconscious thought, then, may be remedied with certain practices like tarot. “It’s a form of mental health,” says Medina. “Sometimes, we get in our heads and we’re mulling over things or stressed out. I think it can be relieving if you pull some cards for yourself."